Healthy food can be colorful and tasty. If you don’t believe it try this delicious soup! Pour the extra virgin olive oil in a large pot and heat it on the stove at low heat. Add the 1/2 garlic clove and brown it for a couple of minutes. Keep a few cubes of pumpkin and four broccoli florets aside for garnishing. Put the rest of the pumpkin and the broccoli together with the potatoes in the pot. Rise the heat to medium and sweat the vegetables for a few minutes. Add the hot stock. Cover and cook until the vegetables are soft (around 20 minutes). 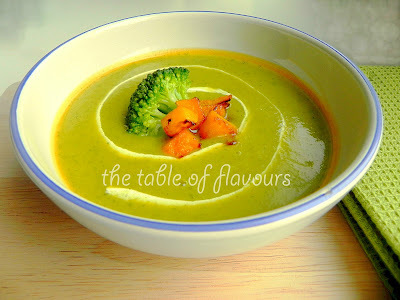 Take the pot from the stove and, using a blender, whiz the soup until smooth. Season with salt and pepper. Roast the remaining pumpkin cubes in the oven until they start to brown. Boil the remaining broccoli in salted water for 3-4 minutes, then drain. Serve the Broccoli and Pumpkin Soup in individual portions, garnished with a tablespoon of cream, one broccoli floret and a few cubes of pumpkin. Sounds very yummy. I am on a diet, for my health, and don't eat most high glycemic vegetables, but do eat butternut pumpkin. Do you have a suggestion of what I could use that I could use in place of the potato? My thanks. I love what is available to try cooking, just by looking on the internet. You can either omit the potatoes and simply add more pumpkin, or substitute the potato with parsnip. Enjoy and let us know how your soup is tasting! 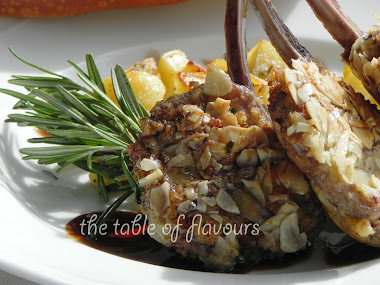 Join The Table of Flavours! Erica started to cook when she was still a child. With the years her passion for good food grew up as her skills in the kitchen. After she graduated she started to move around Europe for studying and working reasons. This gave her the occasion to meet new friends from everywhere around the world and to learn their recipes, but she also loves to disseminate the Mediterranean cuisine!